Picture the scene: It's Friday night, the working week is over and you have just poured yourself the biggest glass of your favourite wine. From the bathroom an overwhelming scent wafts down the stairs telling you that your bubble bath is almost ready for your presence. The bath is hot, the wine is cold and the bathroom smells of sweet goodies. You slip in, lay back and let the weeks woes slip away into the bubbles. Oh wow, there is nothing better than a LUSH bath! Valentines day is this Friday just in case you had forgotten and whether you're single or taken, you can never beat a gorgeous boxed gift set from Lush Cosmetics. I am a huge huge fan of this shop since first being bought a gift set one Christmas about eight years ago. I am hooked! I love the sweet smell, I love how clean and gorgeous their products make you feel, I love that they are vegan and love that they are handmade and fresh so therefore good for your skin. For Valentines day, Lush have created the 'Neon Love' gift box which I have been lucky enough to try out - along with a few extra goodies - and it has to be said, they're all delicious! Whenever I have new products from Lush I almost don't want to use them because of how good they smell and how pretty they look.... Does anyone else feel this way?! 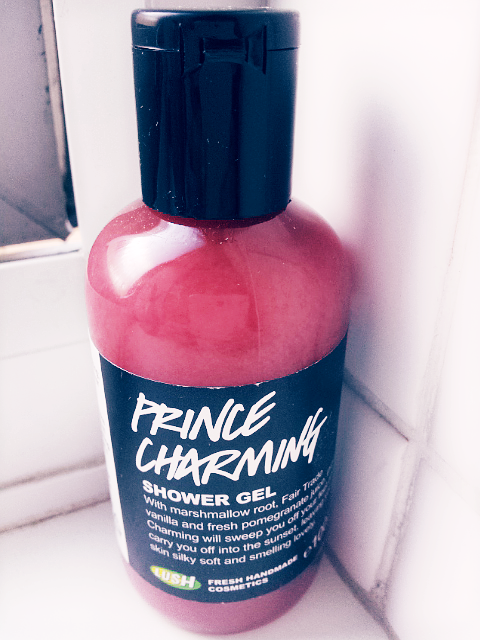 The first product I tried out was the 'Prince Charming' shower Gel which is made from marshmallow root, fair trade vanilla and fresh pomegranate.  It is zesty and fresh, I didn't think I would like it as much because of the fact I am such a huge fan of products such as 'Rockstar soap' or 'Snow Fairy'. The more sickly sweet the better in my eye, I want to get out of the shower or bath smelling good enough to eat. However, despite my reservations I really like this shower gel, it is fresh and fruity and especially great for first thing in the morning. The inspiration behind this shower gel comes from the Adam and the ants song of the same name which is fitting as it is exactly what I sing when I am using it. I haven't tried this out yet, I am saving it for when I am extremely achy and planning on having a long soak. It smells AMAZING. It has that sweet smell that I crave from a Lush product and I just love ballistics; they are great for turning your bath time into something much more luxurious. 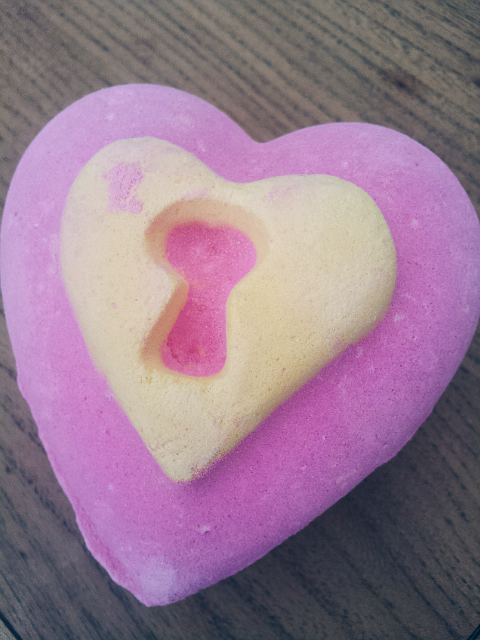 The Love Locket's outer layer is covered in paper hearts which decorate your bath water as it melts and hidden within the centre you will find a heart should you crack your bath bomb in half. 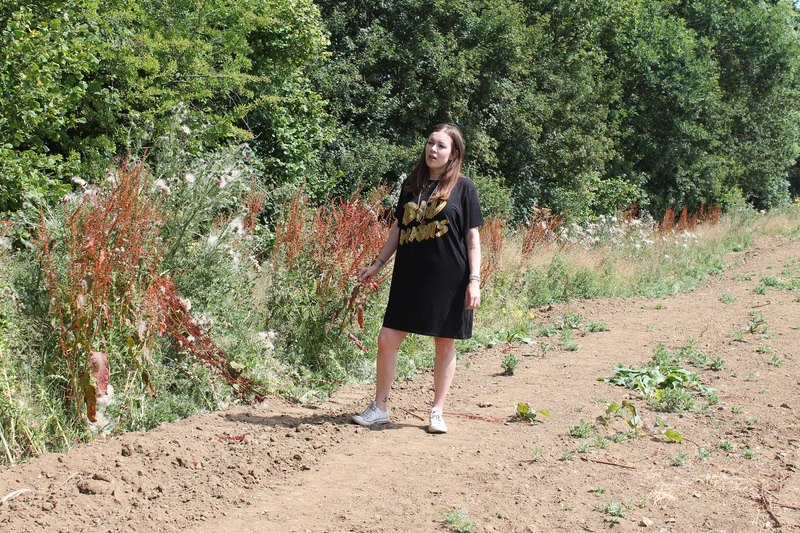 The fragrance is made from Fairtrade vanilla, neroli oil and jasmine. The inspiration behind the Love Locket was inspired by the kind of heart shaped locket you would wear as a necklace. Inspired by the mighty jammie dodger biscuit, this really does smell good enough to eat! I love massage bars, they make your skin so soft and supple and give it a gorgeous glow. It's also a great excuse to get your other half to treat you to a rub down. The vanilla fragrance give this bar a sweet edge similar to my regular Lush favourites and the has a heart shaped hole filled with a fondant centre. This is a returning favourite, it is my new handbag must have! Lush lip balms always really help out my dry lips and are also a handy size so you can pop them into your make up bag and know they don't take up any room. Ingredients include organic mandarin and almond essential oils, Lush have also added guarana seed powder to give your lips a little extra 'oomph' this Valentines day. 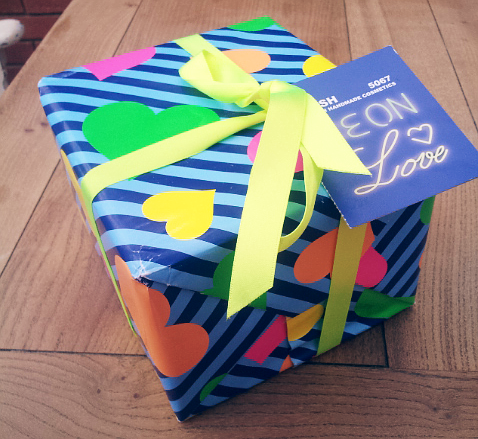 Inside the Neon Love Box is a a collection of delicious goodies! First off there is the the new 'Neon Love Soap', which is heart shaped and made with a blend of figs and passion fruit juice which give it a fresh scent. The 'Turkish Delight Shower Smoothie' leaves your skin feeling silky smooth and smells luxurious thanks to the damask rose scent. There is also another fabulous massage bar in this gift set; called 'Dusk til Dawn' which boasts that with it's 'aphrodisiac ingredients' it is perfect for sharing. Last but not least, there is the 'Red Fun' which has been included as a playful way for you and your partner to leave messages for each other in the bath or shower or even make silly objects. What a cute idea! Great especially for those new loved up couples for which this is their first Valentines together. 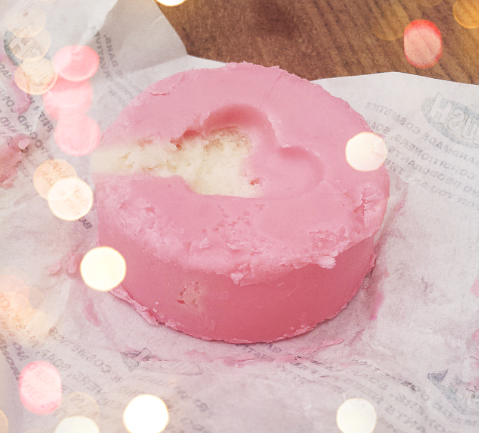 Single or taken, Lush products are the ultimate treat for bath time. 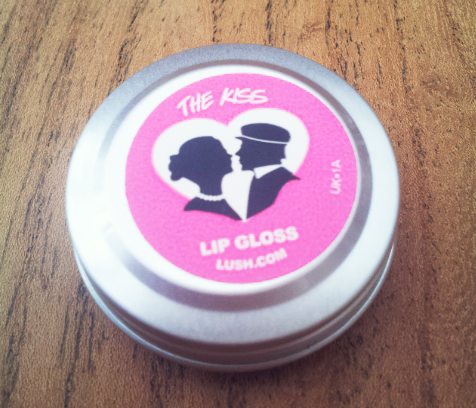 If you are yet to indulge in Lush goodies, Valentines day is the perfect excuse for a splurge! Think you need to go treat yourself! I love LUSH too! You can never have too much lush!